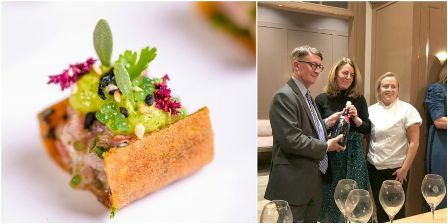 They are delighted to announce that they have retained the title of winner of Country Life Magazine’s Canapé of the Year Award for a second year. 'The Tuna Sea Garden’ is made using Albacore tuna from seafood supplier and Royal warrant holder, James Knight of Mayfair. The creation was masterminded by Henrietta Russell, Head Chef and Alex Drayton, Head of Canapés, and includes ingredients such as fermented pickled ginger, sea purslane, kombu seaweed and tobiko roe. The competition, sponsored by kitchen specialist, Plain English, was judged by Country Life’s Editor-in-Chief, Mark Hedges; Plain English founder, Tony Niblock, Ambassador for Gosset Champagne, Annie Louise Limm, Chef Director at Harry’s Bar and Harry’s Dolce Vita Diego Cardoso, and writer, editor, TV presenter and food critic, William Sitwell. “To be awarded the ‘canapé of the year’ for the second year in a row is an exceptional accolade! The process began when we wanted to emulate our incredible starter dish: ‘The Albacore Tuna Tartare’, which is served with guacamole gazpacho, coriander, sesame and sea herbs. We wanted to recreate the same experience in a single mouthful. People, processes, provenance of ingredients and a tough inhouse judging panel all contributed to the success of this award!”.